You have a website - Yes? Does it show up on the 1st page of an ABACO Google or Bing Search? No? That's where we can help. 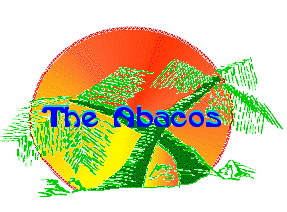 ◊ We do more to PROMOTE Abaco Tourism with a multitude of pages as supported by our No. 1 Positioning in the Google/Bing rankings below. - New folks considering a 1st time Abaco Vacation. ◊ Our pages are being updated all the time. 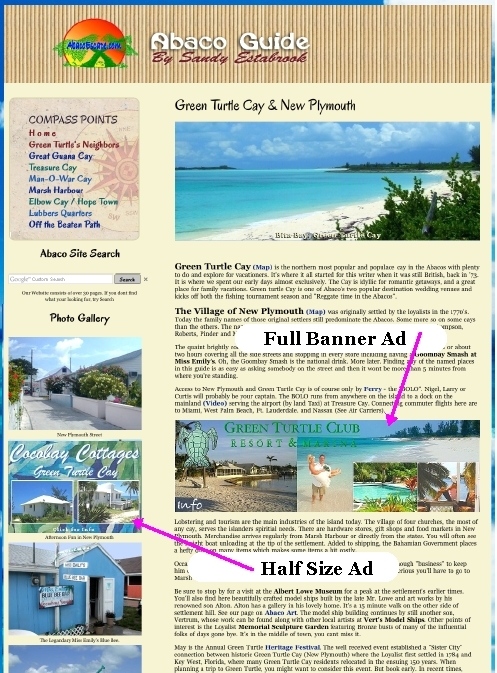 ◊ We are your best bang for your buck in Abaco Advertising using only Fixed Position Ads. No hit and miss rotating banners where more advertisers means less views. ◊ We are a major contributor of contemporary information to Wikipedia's "Abaco Islands"
and we are linked there. ◊ Our pages are not cluttered with or distracted with Google and Internet Ads. ◊ Our Statistical Page is here. ◊ Accolades we've receive are here. FORUM ADVERTISING, Please be mindful when comparing our visits, to that of the ABACO FORUM, their figures reflect multiple posts per day by the same users often three or four times. Using the Forum's own figures, check the numbers to the right and remember that is just six members! Also consider this fact too; with Banner Rotation, the more Ads, the less exposure. WE SHOW OUR OUR NOs. Our Statistical page is here. ◊ Half Size Ad positioned in left side column adjacent to your editorial mention in the main body of the page. Includes link to your website & attractively designed to your approval. No less seen, just smaller. Special offer $250 for two years through January (1 Year $150). Positioning sample.  ◊ Exclusive Banner Ad with maximum exposure. Top positioning on a subject specific page such as Art, Air Carriers, Boating, Chartering, Snorkling, Weather etc. Special offer $450 for two+ years through January, $350 for one. Visit our statistical page for page popularity. Consider, one of our Ad Programs as the place to be - an opportunity to over come lost or limited exposure, and of course position you in front of competition with large in your face attractive ad which you may change periodically for promos etc. Any further questions, please contact us. - Sandy Estabrook / Sandy@AbacoEscape.com. PS. we are ready for when the new domain suffixes catch on with "Abaco.Guide". Our Google search Positioning (after paid for ads or positioning such as Trip Advisor, VRBO, Wikipedia, Fodors, Fromers, YouTube, Amazon etc) Position in parentheses as of 1/1/18.